Governors Island National Monument is located in New York,NY.The island's fortifications - Fort Jay and Castle Williams - served as an early outpost to protect New York City from enemy naval attack and were an integral part of a larger coastal defense network.Governors Island was the command headquarters and military post for the United States Army from 1794 until 1966. For the next 30 years, it was the U.S. Coast Guard's largest and most complex installation. In 2003, the island was sold and transferred to two parties: 22 acres, designated as the Governors Island National Monument, to the Secretary of the Interior, and managed by the National Park Service; and 150 acres is owned by The Trust for Governors Island. 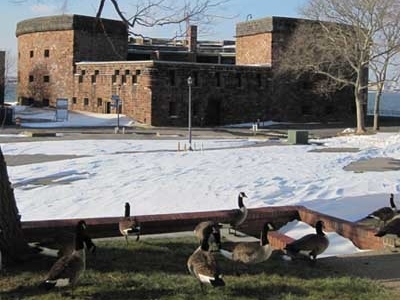 Today, city and federal agencies are in the planning stages of converting this former military installation into new public parkland and a spectacular destination in New York Harbor.Governors Island is open to the public on a seasonal basis. Public services and facilities are very limited. Here's the our members favorite photos of "National Parks in New York". Upload your photo of Governors Island National Monument!